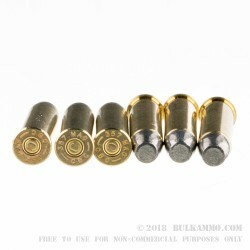 The 357 Magnum has garnered a great amount of attention for itself since its introduction in 1934. This is no doubt due in part to how often pistols chambered in the caliber are featured in popular culture. The Duke himself hefted one around in the detective movie McQ. Danny Glover proved that he wasn’t too old for anything with his 357 in Lethal Weapon. It’s arguably the best gun given to Gordon Freeman in the video game series Half-Life. And Chuck Norris himself, when he wasn’t resorting to roundhouse kicks, carried a 357 in the first couple seasons of Walker Texas Ranger. 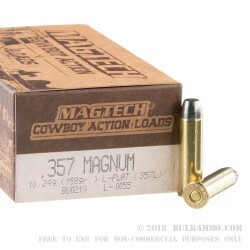 Any one of those boys would have liked this 357 Mag cartridge by Magtech. 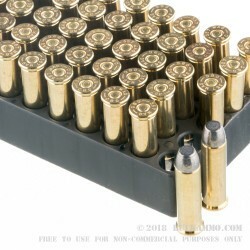 It features a 158 grain lead flat nose bullet, so it’s ideal for practicing at the range where it will type out nice, clean holes in paper targets. It also features a non-corrosive Boxer primed brass casing, so picture The Duke at a reloading bench and you’ll get the picture. Magtech has a good reputation for their ammunition, which they deserve for their high quality components and thorough quality assurance. You’ll get a kick out of this round!